PROM - 020 - Sillenites Ltd.
PROM is a typical optically addressed spatial light modulator (OASLM) with photorefractive Bi12SiO20 (BSO), Bi12GeO20 (BGO) crystals used simultaneously as electro-optic and photoconductive mediums. The basic principle of PROM type modulators is the following. A photosensitive layer detects the writing beam intensity distribution and induces the electron charge distribution inside the crystal. Optical properties of the crystal occur to modify as a function of photo-induced electron charges or photo voltage. The applied electric bias forces to drift the mobile carriers to the crystal / dielectric interface until the electric field in the crystal was cancelled. The photo-induced space charge in BSO, BGO crystals modulates the birefringence through the electro-optic longitudinal Pockels effect. The readout can be realized using a coherent light beam either in transmission or in reflection mode. 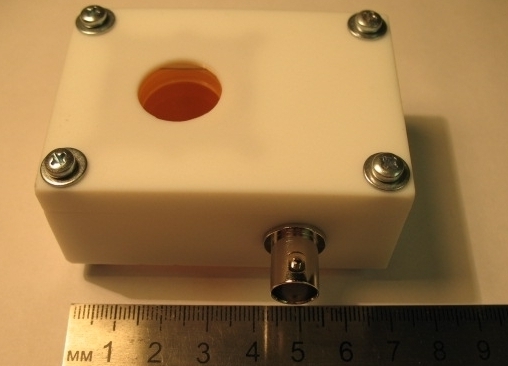 A new type PROM modulator can be developed, manufactured and supplied for customized applications for selected spectral ranges and incident radiation powers.